Macon Candy: See You on the Sweet Side: Mama Always Warned Me About Running the Streets! Wednesday I found out why – and I’ve lived to say the grass sure ain’t greener! Me and big sis Mitty Kitty (a mixed mutt with some serious street sense), dug our way to China . . . or at least the neighbor’s side of the fence. You see, even though we’re inside dogs, we have a doggy door to our backyard. Mom and Shuga D have fretted over exit possibilities, except for one side of the fence blanketed with thick ivy, which they assumed was enough of a natural deterrent. Well, it only made us more determined. As we tunneled our way to the neighbor’s fenced-in yard, we saw a light through their back gate and poked our heads through. On the other side was neighbor and lawn caregiver James, who knew we were up to no good and startled us back into hole we came from. James immediately called Mom to tattle, and less than 10 minutes later, Shuga D arrived to take us back inside. The problem? We were no longer in the neighbor’s yard. While James guarded the back of the fence, I found a way to dig out of the front, like a true escape artist. Free at least, like a rooster, I was strutting across the road, when . . . Well, you can guess the rest because my memory is spotty from there. I do remember making my way into another neighbor’s yard and settling on her stoop, where I tried to tend my wounds. The blood was coming quicker than the licks, and even though I could hear voices calling my name, I was scared to move. Finally, through the fog, I heard Mom’s voice. With my two mangled front legs, I slowly made my way towards her. She says by the grace of God, she saw me across the street, ran to meet me and swept me into her arms. Seconds later, Shuga D pulled the car up, wrapped me in his shirt and took of to Hudspeth Animal Hospital, which is less than a mile from our home. Little did we all know I was moments from bleeding to death. So, here I am under the care of Dr. Hudspeth and Dr. Giles. It looks like I don’t have any internal injuries, and my legs will mend with surgeries, time and proper care. Mom and Shuga came to see me today, and even though I’m still a little sedated, we were all teary-eyed and thankful to see each other. Yes, the bandages and cone around my head might slow me and Mom’s social life down as I recover. But don’t think this dog blog is taking a break (which btw, no bones are broken). I’ll keep you posted on my recovery, and Mom is going to do her best to keep me in the Macon loop. 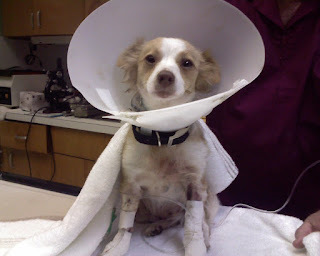 And hey, I’m practically human, so if you want to personally wish me well, send me a Candygram (maconcandy@gmail.com). If you prefer the classic fashion and don’t mind licking or sticking a stamp, you can send it to Candy Lou Walden Weatherford: c/o Hudspeth Animal Hospital, 510 Pio Nono Ave, Macon, Ga. 31204. Just be sure to thank Drs. Hudspeth and Giles and front desk maven Gayle for saving my life. And thanks to all who bowed their head. We will post all the good vibes and well wishes on the site. After all, Mary Poppins had it right – a spoonful of sugar makes the medicine go down!